Blondes may have more fun, but finding the best makeup colors for brunettes is just as easy as it is for women with light colored hair. Be thankful that you are a brunette. Makeup experts wholeheartedly agree that women with dark hair have the widest choice of colors available to them when it comes to makeup. The reason for this stroke of good luck is that there is such a wide spectrum of browns; everything from light golden brown and auburn to dark coffee and rich chocolate brown. Generally, brunettes are encouraged to choose cosmetic colors that are in close proximity to their hair color. For example, if you have light brown hair, then you should stick with lighter color makeup. Likewise, darker brunettes should wear bolder color makeup. In addition to hair color, brunettes should also pay close attention to their skin tone. Do you have brown hair and olive skin, a more ruddy complexion, or a peaches and cream one? 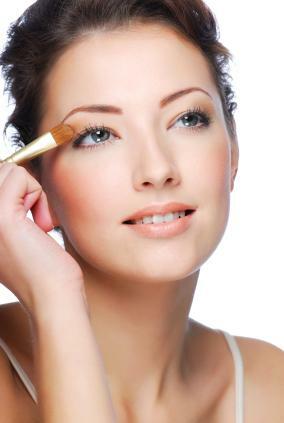 A woman's skin, hair, and eye color work together in determining the best makeup colors. Brunettes can't go wrong wearing neutral color eye makeup. Most brunettes, regardless of where they fall on the color spectrum, look good in warm brown, mocha, coffee and light tawny shades of eyeshadows. These colors match almost any eye color, skin tone and outfit. Plum, lavender, and violet colored eyeshadows also flatter most brunettes. However, if you are looking to add more depth to your eyes, then consider a more daring combination on your eyelids of deep blues, forest greens, golds or burgundy. A gray smoky eye will also flatter a brunette with green, hazel or brown eyes. If you are going out on the town, consider using a dark brown or smoky tone eyeliner. The muddier colors define the eyes and make them "pop" without looking too stark.When it comes to lipstick, most brunettes can get away with wearing red. However, darker brunettes may look better in reds that have a warmer undertone. If you have lighter brown hair then consider applying a pink or rose colored lipstick. If you have darker hair then pucker up in shades of berry, plum, golden pink, brown-pink or wine. These colors can make brunettes with ruddy skin look even redder and less attractive. Colored cosmetics should camouflage flaws and emphasize your best features, not distract from them. However, the only way to know if these shades will work with your skintone is to experiment; this way, you'll know for sure what color flatters you best. In regards to lipstick, brunettes should shy away from using colors that are so pale that they make their lips blend in with the rest of the face. If you have darker hair and light skin, using a pale lipstick will make your face appear unbalanced. Women with blonde hair might be able to get away with wearing very a neutral lipstick, but brunettes need some color to avoid looking washed out. Brown-haired girls have it easier than blondes when it comes to finding makeup colors that complement their complexion. Don't be afraid to experiment with a variety of hues to see what works best for you. Some shades work better than others, but you won't know what color cosmetics accentuate your face best unless you test out a rainbow of different shades. With a little experimentation you can find makeup colors for brunettes that will have you looking and feeling fabulous.